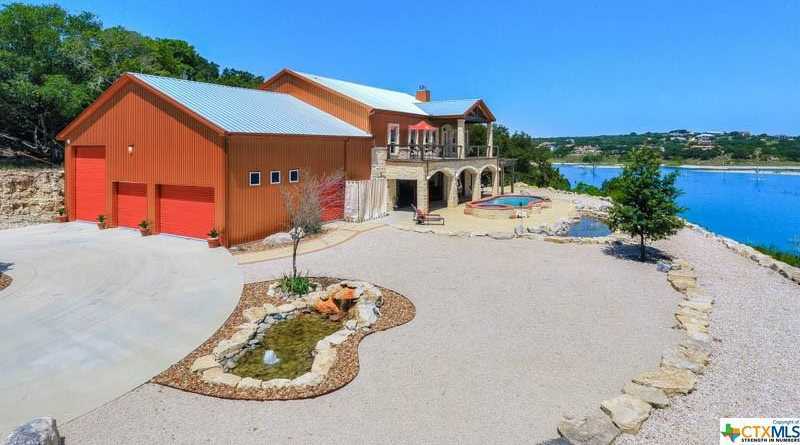 Want a truly unique Canyon Lake waterfront home with 6.5 unrestricted acres & over 450&#x2019; of easy water access for swimming, boating etc. This gorgeous home was built for entertaining and fun! Amazing views abound. Walk off the elevator or stairs into beautifully appointed wide-open main living area with gorgeous views of Canyon Lake from almost every room, high ceilings, wood floors and so much more. Downstairs guest suite w/ gym, and awesome outdoor kitchen/living area with fireplace and roll up doors that open to pool/spa and lake. Separate guest cottage with 2 bedrooms also overlooks lake. There is room to park all your toys, including enclosed RV hookup and drain. With 3 separate living areas, this property is perfect for full time living, weekenders, B&B, or even a corporate retreat. Main home has 3 bdrms/ 2 baths, 2250sq ft up with an additional 516 sq ft including a bedroom, gym, & full bath down Guest house has 2 bdrms/ 1 bath with full kitchen and laundry. Courtesy of Kuper Sotheby’s Int’l Realty NB. I would like to schedule a showing appointment for this property: MLS# 354194 – $1,499,000 – Canyon Lake, TX 78133.